Color Makeover: Marissa Mayer goes green! You often hear the saying ‘everyone can wear black’. Of course we can wear it, that’s not the issue. The issue is can we all wear black purposefully, and to our best advantage? The answer is no. Truly, black is not for everyone. 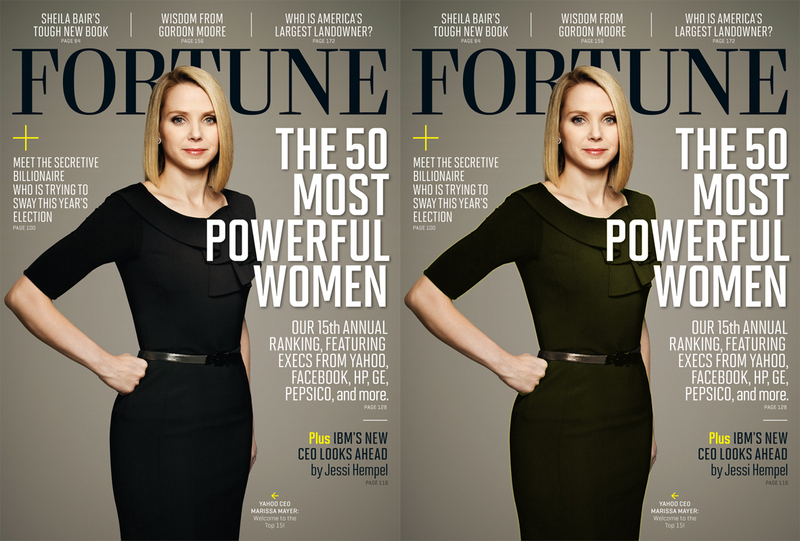 Marissa Mayer, the CEO of Yahoo, has chosen a black dress for the cover of Fortune’s “50 most powerful women”. As we look at the picture, notice how the eye is subconsciously drawn to the dress first, and Marissa second. Why? Because black is not the most powerful color next to her skin tone. A slight adjustment from the intensity of black to a deep rich softer olive green and Marissa is brought into exquisite color harmony, creating a powerful and feminine appearance that is a delight for the viewer.